The chilly fall temperatures have converted me into a full fledged soup-aholic. This recipe, from January 2010 issue of Sunset Magazine, has become a favorite. 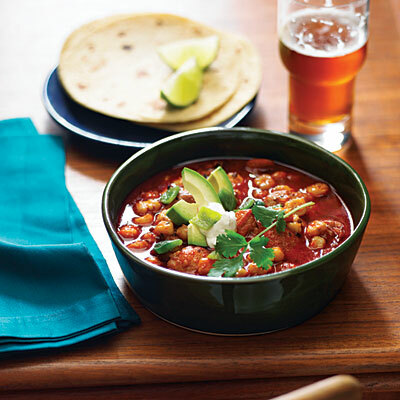 It is a quick and easy version of the popular Mexican stew. We top ours with avocado, lime, sour cream, and a few sprigs of cilantro. It’s also great served with warm tortillas or cornbread. Poblano Chile: These mild peppers usually vary in color from green to reddish-brown. While we definitely prefer it with the poblano chiles (especially when they come from our friend Catherine’s garden! ), you can substitute the mild pasilla chile for poblanos if you can’t find them. New Mexico Chile: This recipe calls for a ground version of the brick red chile, which can be found in specialty markets and in the Mexican section of some supermarkets. If you can’t find New Mexico Chile powder, California Chile powder is a good substitute and is easy to find.